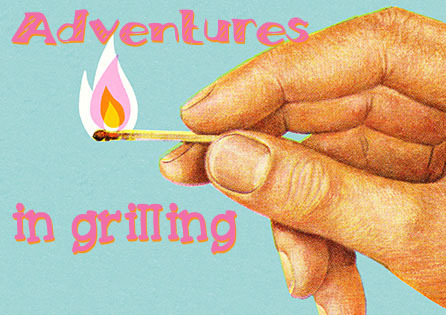 The next time you fire up the grill, give your taste buds a thrill with recipes that are inspired by some of the best cuisines from around the world. These recipes from Omaha Steaks will take you on a culinary adventure right in your own backyard. 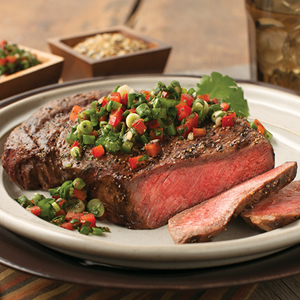 Sweet and spicy Korean, zesty South American and bold Mediterranean flavors make perfectly grilled steak even better. 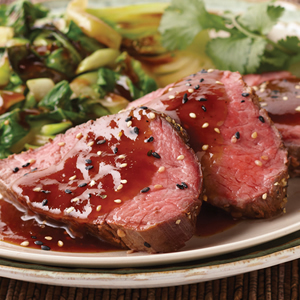 You can find more adventurous recipes at www.OmahaSteaks.com. Allow foods to "rest" for 5 minutes between cooking and eating. This will help them retain moisture when you cut into them. To get your grill time just right, download SteakTime, Omaha Steaks' free app with an innovative grill timer, at www.itunes.com/appstore. Begin by completely thawing tenderloin. It will take 2 days in refrigerator or 1 hour in a sink full of cold water. Remove tenderloin from plastic, and place in a large resealable bag with Korean Barbecue Marinade. Marinate overnight in refrigerator. Remove tenderloin from marinade, and season with steak rub. Sear tenderloin on all sides on a pre-heated grill. Place in a 250°F oven for 1 hour and 15 minutes, or until the internal temperature is 125°F for medium rare. With 15 minutes remaining, prepare the bok choy and heat Korean barbecue sauce. Remove tenderloin from oven, let rest 15 minutes. Slice and serve. Garnish with cilantro and a mixture of sesame seeds. Place sesame oil in a thick bottom pot and add garlic and ginger. Place pot on a medium burner and add the rest of ingredients and slowly bring to a boil. Bring heat down to a simmer and cook while stirring for approximately 5 minutes. Remove sauce from heat and refrigerate for up to one week. In a wok, briefly heat canola oil. Add bok choy and cook for 2 to 3 minutes. Add Korean barbecue sauce and sesame oil to wok and mix well. Serve while hot. Drain sirloin tips and place in a resealable bag with marinade. Marinate sirloin tips in refrigerator for at least 8 hours or overnight. Agitate bag periodically to ensure marinade is well combined with the sirloin tips. Preheat grill on high. 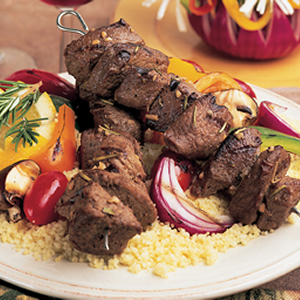 Thread sirloin tips onto skewers. Grill for 4 to 5 minutes on each side. Serve over couscous, pasta, salad or rice. Begin by thawing steaks. Then season and grill to desired doneness. Top each steak generously with Chimichurri Salsa. Garnish each steak with one cilantro sprig.